Is the old lighthouse on St. Simons Island in Georgia haunted? 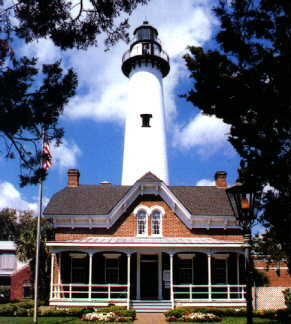 The original building of the old lighthouse was finished in 1808, It was made of brick and tabby and stood seventy-five feet tall. This first lighthouse was destroyed by the confederate army in 1862. A new version of the lighthouse was built in 1872 by Charles Cluskey, one of Georgia's most renowned architects. It is the same building that stands today. This lighthouse is said to be one the top 10 most haunted locations in America, the reason is not because of the amount of ghosts, but for the frequency in which experiences have been reported. In 1880 the keeper of the lighthouse was Frederick Osborne, who lived there with his assistant and both their familys. Frederick was very dedicated to his work which required him to climb the lighthouse several times a day to maintain its operation. During dinner one day, Frederick apparently spoke in an inappropriate manner to his assistants wife. Later that evening his assistant brutally murdered him, he was charged with murder but was acquitted due to the circumstance of the case. There have been many reports of the ghost of Frederick, some have even been published in many different papers across the country around the time of the event.